William Caslon, John Baskerville, Eric Gill, and Matthew Carter: these are the names we associate with great British type design. To the top of that list add Richard Austin. Modern typeface design begins with him. Who was Richard Austin and why are his typefaces so important? And who, by the way, was Richard Austin, wood-cut engraver? 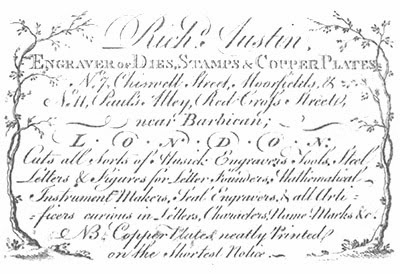 Richard Austin (1756-1833), type-cutter, created the types for Bell & Stephenson's British Letter Foundry in 1788, as well as types for other foundries. In 1812, Austin produced the types known as Scotch Roman. 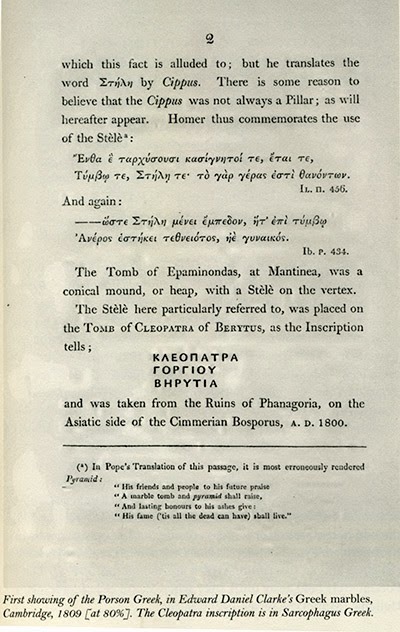 He also perfected the revolutionary Porson Greek typeface of Cambridge University Press. He established the Imperial Letter Foundry in 1815. Richard Austin, "who changed the whole character of Type Founding from the old face style (as it is now termed), with its disproportionate letters and long s's, into the truly elegant characters of the present day" (James Mosley) was the father of modern English typefaces. To his everlasting credit, he killed the traditional f-like long "s" that bedevils modern readers of eighteenth century and earlier texts in english. 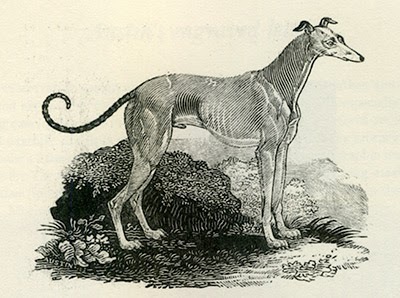 His son, Richard Turner Austin (1781-1842), was a prolific wood-cut engraver. It was once thought that Richard Austin, typeface designer, and Richard Austin, wood-cut engraver, were one and the same person. Alastair M. Johnston, in his new book, Transitional Faces, sets the record straight. This is the first full-length study of the Austins and their place within British printing and publishing history. Based upon previously unpublished material, Johnston, the printer and publisher (of Poltroon Press in Berkeley, California), has written a rich, vibrant, and engaging account of the Austins, their times and the milieu within they lived and worked. This exhaustive investigation, which includes 158 pages of text plus an illustrated survey of Richard Turner Austin's engravings (with 130 examples) and appendices totaling an additional 205 pages, might, as is so often the case with scholastic work on a somewhat obscure subject, be an arid affair, desiccating the frontal lobes of readers. Fortunately, Mr. Johnston (a contributor to Booktryst) is incapable of producing such a work. His analysis of type design and its particulars, which might otherwise cause eyes to glaze, is, in Johnston's narrative, enlivened by his liberal wash of colorful detail and vivid characterization of people and places. 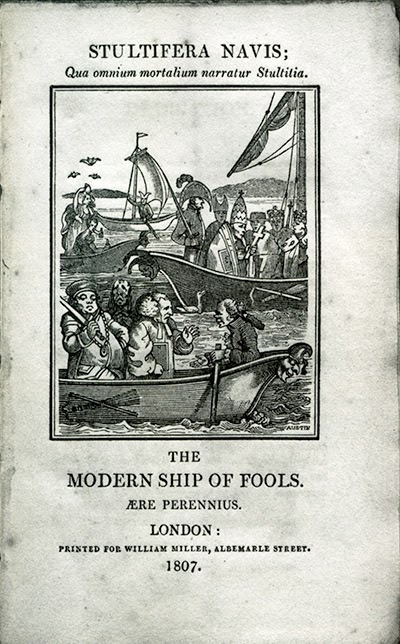 The book's title, Transitional Faces, refers to British printing during the Georgian era when type-designer Austin flourished. The British government, protective of industry, had prevented foreign craftsmen from working in the trade but their skill could not be ignored. The French were doing marvelous things and their influence upon type-design in Britain was enormous. Richard Austin's incorporation of French type aesthetics into British design, "began an era in English type founding (referred to as 'transitional' by Updike, II, 116, 142), a glorious but short-lived time of harmonious types that had the larger-on-the-body proportions of the Romain du roi with the modeling of Baskerville but with more color and fine serifs…'it represents in fact our first independent design,' said [Stanley] Morison, 'owing only its scale to continental models…the type possesses a harmony in serif formation as between roman and italic not possessed by the French type.'" 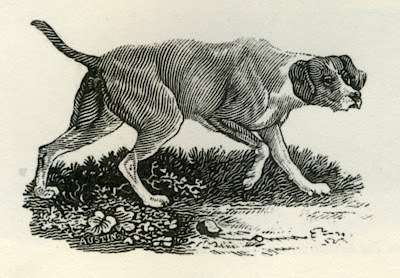 It's impossible to discuss the career of Richard Turner Austin, the wood-engraving son of Richard Austin, without surveying the work of the great Thomas Bewick and the world of eighteenth century wood-cut book illustrations. 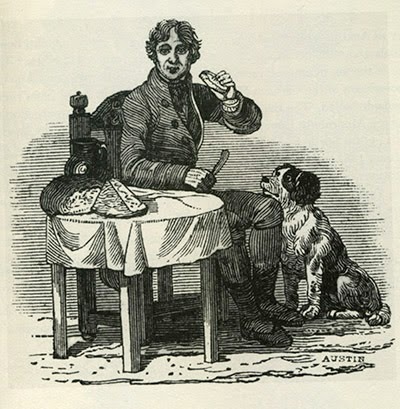 Johnston has, thankfully, devoted an introductory chapter to printed eighteenth century art to prime us on Austin Jr.
Because of Thomas Bewick's influence on wood-cut illustration, Richard Turner Austin is often presumed to have been a pupil or apprentice of his; Austin hewed closely to Bewick's style in his natural imagery. Indeed, many of Austin's unsigned blocks have been attributed to Bewick. and, too, much of Austin's early work copied stock blocks or the work of Bewick. For this reason, early historians neglected him. But Austin Jr. made connections and was soon executing engravings after paintings by William Marshall Craig (c. 1765-1828). In 1819 he moved to Edinburgh, Scotland, where he worked consistently for the next ten years, his blocks, alas, unsigned. We know he did the work simply because, as Johnston points out, there were no alternative engravers who might have produced the scores of woodblocks that suddenly appeared in the "Athens of the North." Yet by 1839, Richard Turner Austin's reputation and work were in critical decline. His wood-cuts, rarely signed, slowly fell from notice and he became a footnote in wood engraving history. It's a direct line from Richard Austin Sr. to W.A. Dwiggins, the great twentieth century typeface designer. 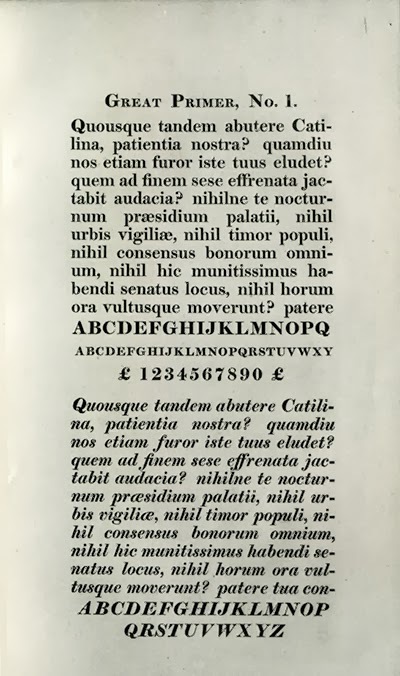 In 1939, Dwiggins modeled his Caledonia for linotype after Austin's Scotch Roman. Austin's Bell and Scotch Roman faces were major influences upon Matthew Carter's digital typefaces. "Thus," as Johnston concludes, "the essence of Austin, diluted somewhat by modern technology, is still a part of our typographical experience." With Transitional Faces Alastair Johnston has resurrected the lives of the father and son, and reevaluated their careers. 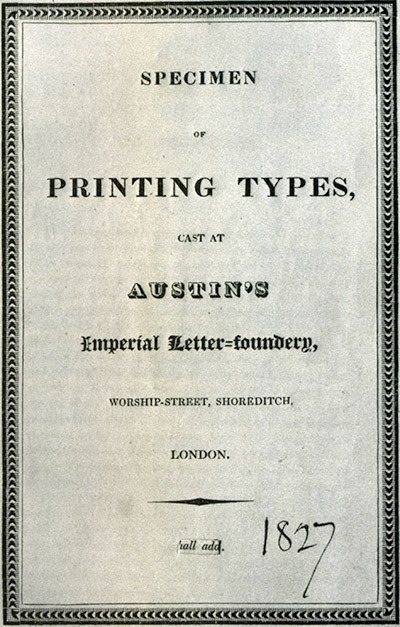 The Austins now take their rightful place in the history of British printing and engraving. JOHNSTON, Alastair M. Transitional Faces. 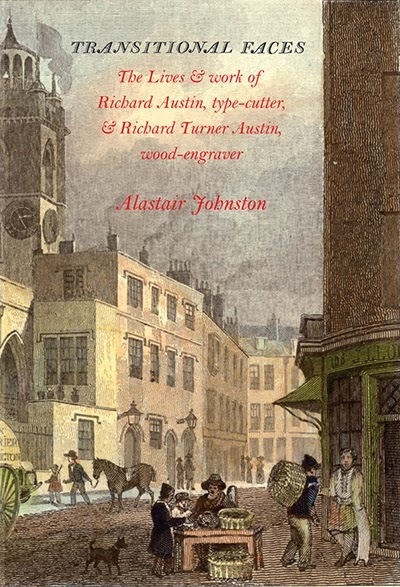 The Lives & Work of Richard Austin, Type-Cutter, & Richard Turner Austin, Wood-Engraver. Berkeley: Poltroon Press, 2013. First edition. Octavo. x, ,, 387,  pp. Illustrated throughout. Burgundy cloth, gilt lettered. Illustrated endpapers. Dust jacket.